I am starting a new thread for this since we are at the dawn of a new freezing season, and snows are now falling once more over the highest latitudes. I think the main question to ask this winter is, will we see a repeat (or worse) of 2017-2018's anomalies? Besides that, if we see anomalies skyrocket as we did in early 2018, will we see a similar result in the spring of 2019 re: all-time historical record cold across many portions of North America (or elsewhere)? I would like to begin the discussion with a few key observations. 1) The Bering Sea has been ice-free for more than 365 days across most locations. It has been accumulating heat like never before. In fact, much of it may have become entirely ice-free due to the ongoing situation since 2007-2012 and residual accumulations of oceanic heat. 2) The situation in the High Atlantic is similarly perilous. The ATL front has been at its most-withdrawn ever position this year, and we still have a month of melt season to go. How much additional retreat do we see north of Svalbard, and how anemic of a refreeze will we see this year? 3) The situation in the ATL has been, IMO, partially caused and exacerbated by the extremely early melt-out of Scandinavia (which, combined with the late melt out of Quebec, resulted in forcing of +++anomalies over much of Europe this summer). Will this extra heat mean that refreeze in 2018-19 is even more anemic than what we saw in 2017-18? There is also the heat content in the NW NATL S of the cool pool which has been making its way to the NE NATL in spurts. This will continue arriving through winter. 4) The situation this spring and summer have severely worsened the ATL cool pool E of Quebec and S of Greenland. 1) Snows are already falling, or will be imminently, over much of the Canadian shield. Will early snowfalls (assuming they are sustained, and I see no reason they wouldn't be given the "stuck" pattern we are in) allow colder airmasses over Quebec/etc earlier in the season than normal? Will this worsen the cool pool as a result? 2) What happens in the High Arctic if we see early continental albedo anomalies this year, combined with residual oceanic +++anomalies in the Bering, Laptev, and Barentz? Will the dislocation of the cryosphere to more northerly mid-latitudes so early on cause even MORE oceanic heat to be advected north, prolonging the melt season for the High Arctic (or at least delaying refreeze)? 3) What years are the best analogy to our current situation, and based on those, what can we expect moving forward? Interestingly enough, the closest recent match appears to be 2014. It features a nearly identical pattern of anomalies across the NHEM for the first two weeks of August. In fact, the only difference this year is MORE heat over the High Arctic (it has actually been warmer than 2012 as well, though the overall pattern has been WAY different). I would argue that the similarity may be due to the Laptev opening so early in both summers. This "highest of latitudes" oceanic ++++anomaly may be the driving factor that forces cold to "stay" in North America vs. giving it more leeway (i.e. the traditional jet), and distributing it across the entire NHEM. If the summer of 2018 is any indicator, we will see even more blocking than we did in 2014-15. ENSO conditions are somewhat similar but the Arctic is even warmer than that year. But, the patterns are still fairly similar. If a similar winter to 14-15 is realized, but with more high latitude blocking in the same regions seen that year, we are likely to realize severe negative temperature departures for DJF across most of North America east of the Rockies. Additionally, Western Europe could also be prone to colder weather than 2014-15, as the residual effects of a colder Quebec / etc = cooler cold pool, cooler cold fronts into W Europe from the NATL. It should be noted that the spring of 2015 saw the development of a major El Nino event simultaneous to severe and enduring -springtime anomalies over my favorite Canadian province. Perhaps this portends another strong ENSO event in 2019, and a similar situation to the spring of 2018 over the same regions previously impacted? This, funny enough, would also follow the pattern set in 2012 (severe melt year), 2013 and 2014 (relative recoveries but cold winters, and 2015 (severe melt year). 2016 was a severe melt year without major ENSO, 2017 and 2018 are both looking like "relative" recoveries in dubious ENSO waters, while 2019 could be our next equivalent to 2015, meaning both 2019 and 2020 could have bad conditions for preserving sea ice. There are vast area's in the pasific ocean where the temperature of the water is like 1 to 2 degree C warmer than normal. That should create the conditions for the moisture you need for your snow. Can you tell something about the wind paterns that bring most of the snow to Canada ? Are they the same for the West and the East ? When i watch Ventusky, i see that the rain in the US always travels from the west to the east. It enters the US north of California. And than it crosses the entire continent. In the east you have the winds coming from the Gulf of Mexico and than moving North, North-East. And you have the trail the hurricanes (and nor'easters) in general take. So where does the snow in Quebec in general comes from ? The Pacific seems to be warm, the gulf seems to be warm. And the trail of the hurricans over the east coast looks colder than normal. But i think they are going to get a healty dose of snow. And that could slow down the effects of global warming in some locations. Like you say, a higher albedo. And colder winds, more meltwater....... So where does the snow comes from, or is it a mix ? This could be something nice to follow up in the next year. The air currents to Quebec have increasingly originated in the CAA / Greenland instead of the Pacific. It seems the further N &E you go in North America, the bigger the shift has been (due to +500MB ridging dominating the W). This allows the Polar Jet (or whatever remains of it) to have a far smaller but much more potent circulation (i.e. this summer's 500MB maps), where its reduced size is not accompanied by fewer storms, rather, they just hit much more frequently. You can roll the EURO forward on tropical tidbits and see how the pattern is circulating the same airmasses from Greenland into the srn CAB / CAA, into NWT / Quebec / The Shield, and then off into the ATL where they pick up the +oceanic heat, deposit it into Greenland, and cycle back for the return trip. Alert, Nunavut, is off the mark today. Last week it was only reporting trace amounts of snow, but at 12Z it has 4cm lying. With temps near or a little below zero, the snow is more of the wet variety. The 4cm coming from a 24hr precip total of 5.7mm. Alert, Nunuvat, is off the mark today. Last week it was only reporting trace amounts of snow, but at 12Z it has 4cm lying. Wikipedia says Alert gets 90 of its precipitation in July and August. That 4 cm (5.7 mm) plus a bit today could be near as dammit it for the year. A Misc Obs from Environment Canada - probably about as significant as 4 cm of snow in Alert, but I could not resist. Snows are a coming. Will the train run off the tracks this year? The projections for September look very impressive. He bbr, a couple months ago you showed a pic. That pic was telling how much melt there was. At that point it was showing 800 km3 in 2 weeks. Is it possible to put a number on it how far that could go ? Like 1200 km3 in 10 days. In general these regions are pretty dry, so probably it want take that much to bring that number up substantial. And could that have an impact on the currents in the Atlantic ? And i hope that's not an stupid question. It's a wall of 800 km long, a km wide and a km thick. That for a large part goes trough the Hudsonbay. And that Hudsonbay is only 150 meter deep on average. That should create some current. Hi Alexander, please bear in mind that not all of that amount goes through Hudson Bay. This was the total drop of SWE over North America. Some of it is evaporated/sublimated, some filters through the ground, and a lot flows in other directions - the Mackenzie watershed goes to the Beaufort Sea, and probably there are other directions too. Your question can be answered more accurately by flow statistics of the rivers entering Hudson Bay. I'm sure some posters on the forum can provide pointers to such information, if it exists. Methinks a maximum flow of 4 or 5 Km3 per day into a basin of 1.2 million km2 is not going to cause much of a current. The biggest effect is to keep salinity low, meaning easier to re-freeze. The Rutgers figure for nh snowcover for August 2018 was 2.73 million km2. This is just about the normal for what is the quietest month of the year in terms of lying snow. Just a few extra bits this August over Yukon and western CAA. By 10/1 it will IMO be much more impressive. The latest EURO is absurd. Early fall snows with large positive anomalies have become a permanent feature caused by open water not previously seen. Rapid melt of the large anomalies in the Spring and Summer due to a warming earth is the other feature we are seeing. Is there some historical data available about how much snow there was ? The real 'fun' comes when we get a real snowfall, and the roads weed out the people who remember how to drive in winter from those who've never learned. It looks like it may continue snowing in Edmonton. This September is shaping up to be quite incredible if the D10 forecasts verify (they are all very similar between the models -- COLD and SNOWY across Canada). And this is only to 9/25! 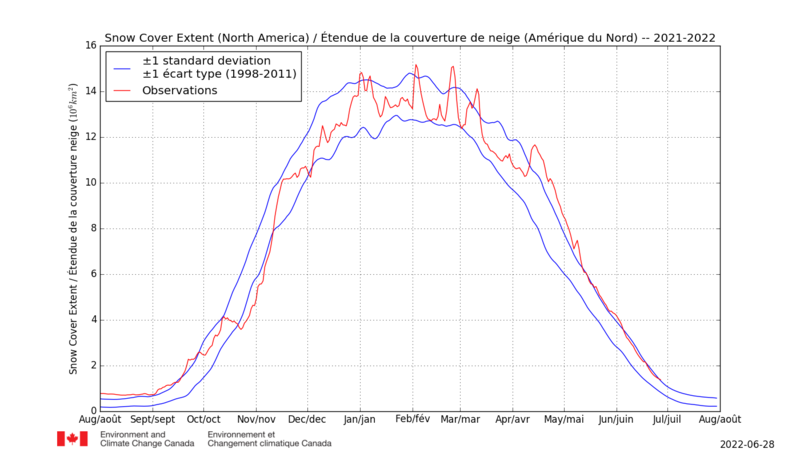 2014 had the highest North American September snowcover anomaly in the Rutgers record back to the late 60s. This year already appears to be something like +1-1.5M KM^2 as of 9/15 (according to the Canadians). By the end of the month we should have a much wider gap vs. avg, in fact, we are already at where normal years are by 10/1. I think 2018 now has a decent shot at taking the "snowiest September" crown from 2014. If conditions are bad enough by the end of September, I wonder what the odds are that we see an extremely early onset of severe winter weather across much of the continent through October / November, with commensurate absurdity RE: accumulated SWE? This is the first year in the recent past I can recall September getting off to such a running start. Volume is also making it onto the charts now. Hoorah! 12z EURO says another 2-4" in Edmonton next 24 hrs. lol. It's September 15th! Wonder how quickly Canada's major cities hit regular snowcover this year. I would bet the worst fall anomalies will be in the areas to the east of the southern Rockies and west of the Great Lakes. Why east of the southern Rockies ? I am not sure. I pick this region because of persistence (in the peripheral seasons it has been having increasingly - anomalies). But beyond persistence, I think it may have to do with the northern re-alignment of the Hadley Cells in the PAC / ATL & increasingly lopsided refreeze of CAA & Hudson vs. Bering and Barentz. It would make sense that as Hudson / CAA spend more of the year ice-covered RELATIVE to Bering and Barentz, -500MB anomalies favorable for cold / snow shift to their vicinity, especially when Hudson & CAA have ice and Bering / Barentz do not. The raring start 2018 has seen re: snowcover has to do partially, IMO, with the very high remaining extent in the CAA and slivers of sea ice remaining in Foxe Basin. Combined with the lack of ice in Bering and Barentz, this will favor a very early onset of winter across the Canadian shield which is now ongoing, as well as a very early complete refreeze of Hudson / CAA (just beginning in parts of the CAA). For some reason, this seemingly favors severe cold over Alberta / Saskatchewan / Montana / Dakotas. I think it is because the moisture flux from all the excess water vapor results in much more consistent snowcover during wintertime, which is now extending to the early and late season. And all you need for severe negative monthly anomalies is consistent snowcover (in spring and fall, that is). The increasing fortitude of the CAA / HB ice is also now seemingly anchoring a perpetual vortex of major -500MB anomalies nearby. It looks like Edmonton may set its new September record in a day or two. I believe they have about 5CM currently, need 7CM to surpass 1965's 12.1CM. Coincidentally or not that winter was also a moderate El Nino. A northern Alberta farmer situated about 70 kilometres north of Grande Prairie — an area which was forecasted to get 10 to 15 cm of snow Wednesday — Sekulic had only heard stories from his grandparents about snow showing up so early in September. Much colder air continues to invade much of northern and central Alberta leaving many places feeling 10-15 degrees below normal values. The potential is also growing for the second round of accumulating snow in Edmonton this weekend, which could help to mark one of the snowiest Septembers on record for the city. The current record dates back over 50 years ago when 12.9 cm fell during the September of 1965. It is uncanny that we are seemingly repeating 2017-18 (but colder / snowier this yr IMO). Will Edmonton blow the 1965 record away by 9/30? Today's 00z EURO through D10. Note Edmonton most certainly sets a new record if it comes to pass. Plenty of storms in the North Atlantic next week. And they transport moisture north. "Why east of the southern Rockies ? " Look at this elevation map, that area is likely to precipitate the moisture out of clouds, as snow. With Beaufort more or less ice free, Pacific ingress, increasingly variable weather patterns, evaporation driven south is inevitable. It seems most likely it will be condensed out against the Rockies, but where it heads further south those high prairies force the clouds high enough to make snow, whereas by Winnipeg you'd expect rain, or just passing clouds. I thought he was talking about the area further south, in the US. Where you have these drought conditions. That area seams to be cut off from moisture coming from the gulf, and in general it's missing what is coming from the pasific. But further north he could be right. Of the reporting weather stations in Canada, Tuktut Nogait is leading the way with 42cm lying snow this morning. It is located in Tuktut Nogait National Park (famous calving grounds for young caribou) in the Northwest Territories. Winds have been NW coming down off the cold, icy pack in the eastern Beaufort and CAB but then picking up moisture over the ice-free Amundsen Gulf which is a good recipe for snow-making. Like the Great Lakes snow effect. Helps too of course that the station is at altitude of 552m. Do you think the moisture comes from the Amundsen Gulf ? I don't know how much evaporation you get at some temperature, but it can't be much at that point. And there is very little vegetation. If i had to make a bet, i would say it comes from the Pacific. But i can be wrong. Normaly it can not be that hard to find out how much evaporation you get at some kind of conditions. Do you think the moisture comes from the Amundsen Gulf ? Chart attached shows the synoptic situation around the time when significant snow started to accumulate at Tuktut Nogait. It was a cold airmass coming down from the NW but crossing the ice free Amundsen Gulf area (circled) before depositing downwind at the Canadian mainland. With Lake Effect snows a cold air mass moves across long expanses of warmer lake water, warming the lower layer of air which picks up water vapor from the lake. 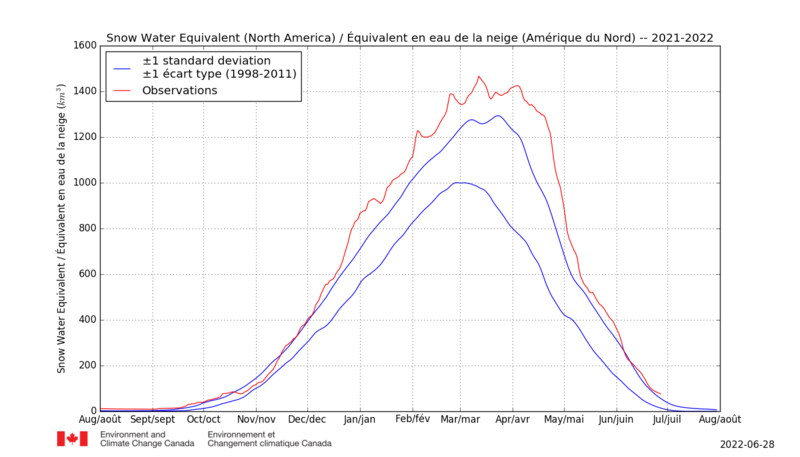 For this part of Canada October is the snowiest month. You have a combination of cold weather but often both the Beaufort and Amunden Gulf are not frozen. Once the sea areas are frozen over snowfall decreases significantly. 18z para GFS is... a notch snowier! Snow into the northern tier of the US by D8-9, Quebec is getting buried. It would certainly help if you used language that acknowledged that this is a forecast that goes out 8 days. It would also be useful if you did not suggest that all of Quebec is "getting buried". It is currently 81F in Montreal. And this is the forecast for Ft. Mckenzie. Highs in the low to mid 40's through Friday. I would also call into question the accuracy of the map. It seems to suggest that northern Wisconsin will see snow in the next 8 days. I am very familiar with Wisconsin. Here is the forecast for Rhinelander which shows snow on that map. The lows over the next 15 days are in the 40's with the highs in the 60's. A lot of precipitation is in the forecast but it is all rain. That map also shows an impressive band of snow accumulation across central Ontario (6" to 10"). Attawapiskat on the west coast of James Bay is right in the middle of this band. Here is the forecast. Temperatures never drop below 32F over the next 7 days with highs around 50F with a small amount of rain in the forecast. There is a chance of snow mixed with rain on 9/22 but total precipitation is supposed to be less than 1 mm. Of course. forecasts are forecasts and there is no certainty that the ones I have posted are more accurate and so we will have to wait. Since this is your thread, it would be useful for you to post a follow up in 8 days to see how this heavy snow forecast plays out. I agree. I think your forecast links use the GFS. The para GFS is apparently snowier. The ECMWF also seems more sensitive to retaining cover (and the Canadian is also superior to old GFS at least). Today's 12z PARA is also pretty absurd. The Canadian has large falls into Montana but both PARA GFS + EURO have heavy snows well into the Rockies / NRN US Plains. Despite the outright anomaly of such a scenario ^, I think the bigger takeaway from today's runs is the potential for non-stop seasonal snowcover to be commencing across Nunavut and Quebec. If the 12z EURO's totals are accurate, that cover is deep enough to withstand any temporary warm incursions (and long range models show barely any of that, anyways). No, just average precipitation in the far north, and below in Quebec. -- Weak El Nino conditions are anticipated for early fall. El Nino may become moderate in strength by late fall. -- Warm and generally dry conditions to dominate across the southern Prairies. This may be beneficial to the early fall harvest. -- High fire danger likely to linger through early fall across much of western Canada with smoke continuing to be an issue, especially from southern BC through the southern Prairies. I also see an increased fire danger for Quebec. -- Primary storm track will direct most of the storms and wind up into the northern half of BC and southwestern portions of the Yukon Territory. -- Best opportunity for early season cold outbreak appears to be across far northern Quebec into Labrador. -- Advancement of sea ice across the far north will be slower than usual once again. The scale of 2018's September + anomalies in the Bering is astounding. 2012 had nothing close, in fact, that region was actually - in Sept (through the 16th). I wonder if suspicions re: the state change in the Bering becoming an increasingly key factor behind N American cold may be correct? Maybe as Hudson Bay becomes increasingly ice-covered relative to Bering, (possibly partially due to Bering's melt / accumulated oceanic heat?) it amplifies the impact even further. So how is that 8 day forecast holding up? It forecast an accumulation of 6' to 10' in Attawakispat, Ontario by September 25. Here is the current 7 day forecast to 9/27. Hmmmmm....highs between 6C and 12C for the next 7 days with only 2 nights dipping below freezing. It looks like the Para GFS may be too aggressive but I would also not take an 8 day forecast verbatim. Is it snowing in Quebec and other places? Yes. It is snowing everywhere it said it would? Maybe not. In any case, I like the below projection from the Canadian re: illustrating where maximum cooling is taking place due to whatever is happening Bering etc (we discussed a few posts ago). Also, 00z models are very, very snowy. I suspect northern Quebec is on the verge of full coverage through next July. I will bet this is way too aggressive and will change but posting in case it does come to pass. Look at the Midwest! It is SEPTEMBER (also why this will probably not happen)! I think it is more noteworthy than it would be otherwise because the areas affected ^^ were also some of the coldest relative to normal in the springtime. PS -- Edmonton now has the record! With more to come and 10 days left in the month, it is already almost double the old 12.9CM from 1965. "According to Global Edmonton weather specialist Mike Sobel, the Edmonton International Airport had experienced 22 centimetres of snow prior to Friday, which surpassed the previous high of 12.9 centimetres set in 1965 by a substantial margin." PS -- Edmonton now has the record! Absurd or not, it's already melting/melted. The report talks about accumulated precipitation. There's just a bit of snow left on the ground outside my window. It should all be gone by Thursday, when the temperature is supposed to rise to 17 C. It's traditional Alberta weather, if you don't like it; wait five minutes. If 12z models are correct looks like you could see another 10-15CM+...! Environment Canada is predicting 5CM. And above zero temps for the rest of the week. It's still early for winter to set in this far south. By mid October, hopefully after the crops are harvested, we should see snow arrive and not go away again. The nice thing about the early snow is that it reminds me of winters in the 1970s, although it's still much more humid than it used to be. Out of curiosity, do these 8 and 10 day predictions posted here ever come true? I read this thread for its anecdotal news value, but predictions alone aren't enough. The 8-10 day predictions contain all the snow *through* D8-10. So those maps are usually fairly accurate in overall detailing even if some parts are not (e.g., the forecast through D4-5 is usually pretty reliable, the D6+ is not). I think the D6+ stuff has more value when the models all show the same thing. Funny enough, that is exactly what they are now doing in the northern Lower 48. GFS-Para, GFS, all show major accumulating snows down to the mid-Rockies and the Dakotas. However, the EURO is showing the stripe of highest accumulations somewhat north, with Calgary taking the brunt. Snow Water Equivalent (SWE) is also high, but not by so much. ps: Click on the map for a better view, click again for maximum size. pps: On my machine the website often looks like it has not been updated - I have to delete browsing history to get the latest figures if refreshing the page doesn't work. Snow Water Equivalent (SWE) - the mass of water contained in the snow. Usually considered to be 10 units of snow depth = 1 unit of water depth.